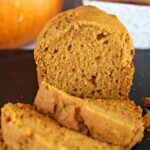 This simple Pumpkin Bread is a treasured family recipe that makes an appearance when the leaves start falling each year. It is the perfect bread to share with your neighbors or freeze to enjoy in the months to come. Preheat oven to 350F. Generously grease 7- small (6″x3″) loaf pans or 2 large (9″x6″) loaf pans with nonstick cooking spray. In a large bowl, combine the dry ingredients – flour, sugar, cinnamon, nutmeg, baking soda, and salt. Set aside. In a medium sized bowl, add all the wet ingredients- pumpkin, eggs, oil, and water. Whisk together until combined. Pour wet ingredients into the dry ingredients and gently mix until all ingredients are combined into a smooth batter. Pour batter into greased pans. Bake smaller loaves for 40 minutes and larger loaves for about 1 hour or until toothpick inserted comes out clean. Allow the loaves to cool on a wire rack before removing from the pans and storing or freezing. I wrap the cooled loaves in saran wrap and place in a Ziploc bag to store in the fridge or freezer. Preparation time: 5-7 minutes. Cooking time: 40-60 minutes, depending on pan size. Number of servings (yield): 20.